Welcome to the age of the visual web. According to recent research from Pew Research Center’s Internet project, 54% of web users have posted original photos or videos to websites and 47% share photos or videos that they found elsewhere online. They say a picture is worth 1,000 words, and that is especially true when it comes to online holiday shopping. The emotional connection from posting and sharing photos of holiday gifts creates a new form of visual storytelling for both consumers and marketers alike. 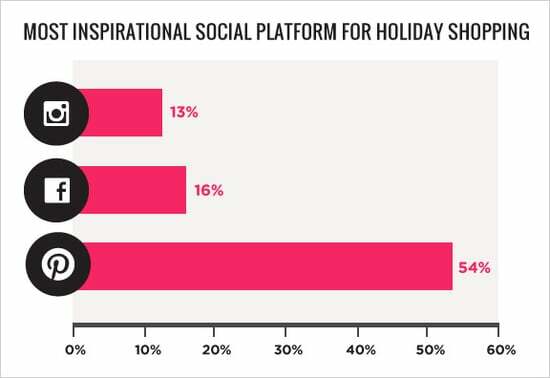 In our 2013 Holiday Shopping report, we asked women if they’ve ever posted photos of gifts they’ve received to a social media site and which social media platforms they feel are the most inspirational in helping them decide which products to purchase for their friends, family, and co-workers. Our findings showed that nearly 50% of women have posted photos or videos of holiday gifts they’ve received to a social media platform. Women are more likely to post their photos or videos to Facebook (29%), Instagram (27%), and Twitter (10%). In terms of inspiration, it’s not surprising that visually focused social media platforms like Pinterest, Instagram, and Facebook are considered to be the most inspirational by women who are shopping for holiday gifts. 54% of women selected Pinterest as the platform they find most inspirational, placing Pinterest ahead of both Instagram (16%) and Facebook (13%). Women between the ages of 18-34 are also more likely to consider Pinterest and Instagram as the most inspirational, while women over the age of 35 are more likely to consider Pinterest and Google+ as the most inspirational platform. The growth in the adoption and usage of mobile devices and the improvements in image quality allow for an emotional depth and storytelling for both consumers and marketers that haven’t always been available. Consumers are finding new and creative ways to document their life experiences, share those experiences with their friends and family, and connect with individuals who share their passions. Marketers should embrace this trend by helping consumers creatively document these special life moments and celebrating the connection a consumer has with their brand by creating opportunities for deeper engagement with their products. Marketers should also seek to partner with original content creators to collaborate on unique and original programs. A focus on visual storytelling in their marketing will help brands create a deeper emotional connection with their target audiences that will resonate way beyond the first impression.